Re the 19th century difference: Even in the NH, undersampling will be a bit worse back then. But take the SH data (already undersampled) and split it into two bits, and it could be pretty bad. So I think the difference will be how the grid boxes are used, along with using SH. Tamino is using coarse grid boxes. GISS is using distance-weighted interpolation to points within smaller grid boxes. With undersampling, this will likely have some impact. With well-sampled data, it won’t matter. Thanks for the timely analysis drj. Any chance it would be easy to whack another mole by generating a similar graph for all urban stations in the U.S. and all rural stations, to tackle the contrarian argument du jour: http://wattsupwiththat.com/2010/02/26/a-new-paper-comparing-ncdc-rural-and-urban-us-surface-temperature-data/ ? Is that because we’re using Southern Hemisphere data as well, or is it because of the difference in station combining? Further investigation is merited. Are there fewer thermometers in the 1880? Is mal-distribution more obvious? If the answers are yes, the difference in the mean may just be a consequence of uncertainty in the mean using a smaller number of measurements aggravated by sub-optimal distribution for determining the area averaged temperature. Also, because you use the anomaly method, unless you did something unconventional, your two versions are forced to match on average during the shared baseline. If there are real differences arising from using different stations, the consequence of those differences will be more visible further away from the baseline periods. I would not be at all surprised to see the various versions of computing the surface trend diverging as the trends go back in time. @lucia: I have access to same data as you do when it comes to answering the thermometers question, but I assume you also know the answer. And yes, of course poor sampling will lead to more divergence, in probability. GISTEMP uses the anomaly method, and ccc-gistemp is an emulation of it, so yes. And yes, that will force the average over the base period to match. The choice of base period is irrelevant to the trend, however. @Zeke: Not until Monday, and maybe not then. If however you have a handy list of Rural and Urban stations, do please cut the input data yourself! Zeke: You might be asking the wrong guys. That particular assertion is about the USHCN adjustments, I’m pretty sure. Those adjustments are already baked in, before GISS or ccc starts doing anything. You’ll want to go to the USHCN web page, get the raw data, TOB adjusted data, and final adjusted data, and go from there. If you must cheat, the NCDC has made the code available for their adjustments, but I think simple comparisons of the raw and final sets would suffice, for starters. I have access to same data as you do when it comes to answering the thermometers question, but I assume you also know the answer. I suspect we are talking at cross purposes because I used rhetorical questions, which I actually know should be avoided in blog comments. They cause confusion, and that’s my fault. What I meant to communicate was that to extent that the answer to my rhetorical questions are yes (and I suspect they are even without looking or running any code), I think we should expect see divergences in computed anomalies in the early thermometer record. Do we more or less agree on that? Or do you think it’s something else? I am also saying that — without looking at the code or data — if we look at any T_anomaly vs. Time graph, and there are real differences (or even difference resulting from statistical uncertainty) those will appear larger far from the baseline periods. This effect should be rather data independent because its a direct consequence of the anomaly method. So, for example, if you happened to re-baselined using 1880-1900, the match would look poor now, and good back then. I think that sort of re-baseline would be misguided because it makes no sense to baseline to a period with larger measurement uncertainties– but that is what would happen if we did pick that period. Anyway: Once again, the reason we see the slight mismatch back in 1880-1900 [ed: and again] is at least partly related to the choice of baseline. b) the anomaly method does have a tendency to force agreement in the average during the baseline period. So no matter the cause of differences, they will be more noticeable far from the baseline period. Anyway, I think your post is useful. To my knowledge that makes the fourth post that shows the drop out in thermometers does not cause a bias in the long term trend. Zeke: although we’re not set up to do experiments with the NCDC datasets, it would be very easy for us (or for you) to do a ccc-gistemp run without any US data. The GHCN data, which is the great preponderance of our input dataset, is raw. As for the UHI adjustments done in GISTEMP: they do not adjust rural stations at all. Only urban stations are adjusted, and urban stations which cannot be adjusted are dropped. See our current step2.py. Good catch. I forgot that GISS used adjusted USHCN (but raw GHCN) data as inputs. Off topic, but I noticed that GISS has switched to using night lights for all of its urban adjustments, not just the US48. Are you guys privy to those changes? January 16,2010:The urban adjustment, previously based on satellite-observed nightlight radiance in the contiguous United States and population in the rest of the world (Hansen et al., 2001), is now based on nightlight radiances everywhere, as described in an upcoming publication. The effect on the global temperature trend is small, that change reduces it by about 0.005 °C per century. 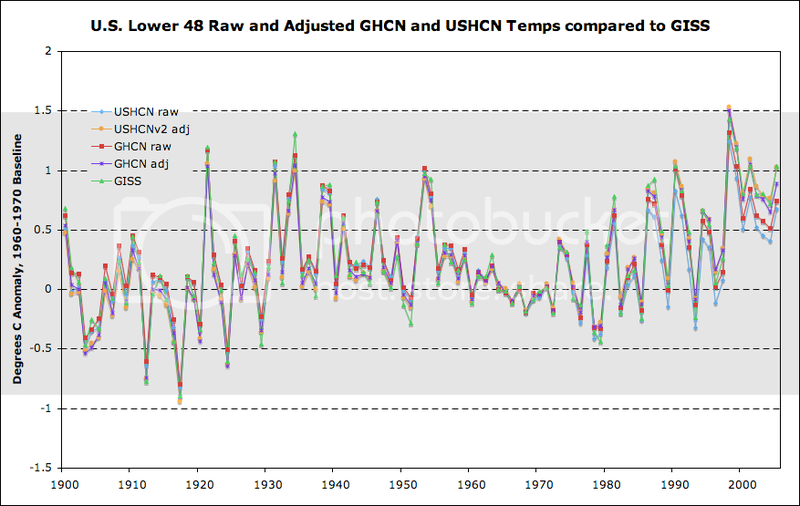 Also, I noticed with the newest USHCN_V2 data, GISTEMP’s lower 48 analysis shows a bit more warming that it had previously. In fact, both 1998 and 2006 are now warmer than 1934. Hansen et al. 2001 had stated that they couldn’t declare a warmer year than 1934 until it was exceeded by at least 0.1 degrees, and the new figure for 1998 exceeds that (2006 is 0.1 warmer). cce@10: Yes, I’d noticed the GISTEMP change, a few lines in STEP2/text_to_binary.py to fish a different field out of the station metadata file. I’ll be making a matching change in our sources before our 0.4.0 release. cce@11: GISTEMP, and ccc-gistemp, doesn’t include a “lower 48 analysis”. 95% of the world’s population wouldn’t know what a “lower 48 analysis” might be. I do know, and I also know it would cover about 1/60 of the global surface, so temperatures there are not very relevant to our results. When you say “I noticed”, whereabouts did you notice this? Can you provide a link? @cce, @Nick.Barnes: “lower 48″ may be a reference to GISTEMP’s figure D. In my opinion this is wildly parochial. It was very relevant during the so-called “Y2K” controversy and is the primary reason why so many people belive the ’30s were warmer than recent years. That is, they confuse the US with the world. 1998 and 1934 have been statistically tied for a number of years (I believe since the TOBS improvements incorporated in 2001), but now 1998 is back to being significantly warmer than 1934. Comparing GISS-temp to adjusted GHCN temp for the globe is less interesting, since the methods are rather different. @Lucia: I do not think we are talking at cross purposes. It’s fine to ask rhetorical questions (although I do have a tendency to answer rhetorical questions). But since you and I both know the answers to your rhetorical questions, I wasn’t sure what the point was. You ask if I agree “that statistical uncertainty may be sufficient explanation of the approximately 0.2C difference in temperature anomalies computed using the two different thermometer sets back in 1880-1990″. Well, yes; I already said “poor sampling will lead to more divergence, in probability”. and we can see that the 1800’s still have greater divergence. Of course we are in broad agreement, but I still think there is room for further investigation. In particular I think we can learn a bit more than “it’s just statistcal noise”: How much the difference between this analysis and Tamino’s is down to difference of station combination method? How much is down to different data? (and how much is essentially uninteresting variation due to poor sampling). A northern hemisphere graph from ccc-gistemp will help with that. cce@14: Ah, yes, figure D. That was originally in Hansen et al 1999. I am reading that paper now. It describes in great detail an algorithm similar, but not identical to the GISTEMP algorithm (the main differences I see are that it uses a 2-degree grid, and has less flexible UHI adjustment). I imagine it then area-weights the series for grid squares which include parts of the “lower 48″. Because this figure is so very parochial, it’s not very high on my list of priorities to reproduce it. I might send email to GISS to ask how it is done. It would be the work of a few minutes to generate a US-only graph, by running gistemp using lower-48 data only, but that isn’t what Hansen et al 1999 describes. Without running any code at all, I can speculate that changes in this chart over time might be caused by the switch from USHCNv1 to USHCNv2 input datasets. I’m pretty sure the USHCNv2 changes are the cause. They began using it in November. I don’t think they updated the figure D graphic and table until February. Also be sure to read Hansen et al. 2001 if you haven’t already, “A closer look at United States and global surface temperature change,” which is the most recent paper to describe GISTEMP. Sorry if this is mentioned elsewhere, but why are you referring to station drop out, when in fact it is actually old station data being added? 1961–90 as a contribution to WMO (WMO 1996a). Turboblocke: sensible people know the history of how the GHCN was built. But the blog terminology was set by certain conspiracy theorists, so ‘drop’ is what sticks. ‘Drop’ is also less cumbersome than other semantic constructions. trend lines for both cases. See that list of mostly 2 digit numbers separated by commas? That’s the two data series (separated by %7C in the middle). The numbers are the actual anomalies in centikelvin (or 0.01 °C if you prefer). -999 is “no data”. This is true for most (all?) of the charts I’ve prepared for this blog. They’re made with Clear Climate Code’s vischeck.py tool. Trend calculation was always on the todo list; now I’ve created Issue 49 so that we have a permanent reminder. This post was referenced in an investment research paper called “Climate Change: Addressing the Major Skeptic Arguments”, by Deutsche Bank Climate Change Advisors. @cce: Hmm. What do you suggest we do? I suppose a ccc-gistemp version of Figure D is vaguely on the cards, and I’ve created Issue 101 so that we don’t forget about it completely. Perhaps an email to Reto Ruedy to see if he could make the source code available. Somewhat related, a cool feature for ccc-gistemp to have would be the ability to generate time series for individual countries. I wonder if you could pull country masks out of Google Earth or similar mapping software. @cce: Yep. I’ve added a note to the issue so that we don’t forget to make it flexible enough to do other countries.